the changing definition and understanding of art. In itself, of course, photography is simply a medium, like oil paint or pastel, used to make art but having no inherent claim to being art. After all, what distinguishes an art from a craft is why, not how, it is done. But photography shares creativity with art because, by its very nature, its performance necessarily involves the imagination. Any photograph, even a casual snapshot, represents both an organization of experience and the record of a mental image. The subject and style of a photograph thus tell us about the photographer's inner and outer worlds. Furthermore, like painting and sculpture, photography participates in aspects of the same process of seek-and-find. Photographers may not realize what they respond to until after they see the image that has been printed. Like woodcut, etching, engraving, and lithography, photography is a form of printmaking that is dependent on mechanical processes. But in contrast to the other graphic mediums, photography has always been tainted as the product of a new technology. Apart from pushing a button or lever, or setting up special effects, no active intervention is required of the artist's hand to guide an idea. For this reason, the camera has usually been considered to be little more than a recording device. Photography, however, is by no means a neutral medium; its reproduction of reality is never completely faithful. Whether we realize it or not, the camera alters appearances. Photographs reinterpret the world around us, making us literally see it in new terms. Photography and painting represent parallel responses to their times and have generally expressed the same world view. Sometimes the camera's power to extend our way of seeing has been realized first by the painter's creative vision. The two mediums nevertheless differ fundamentally in their approach and temperament. Painters communicate their understanding through techniques that represent their cumulative response over time, whereas photographers recognize the moment when the subject before them corresponds to the mental image they have formed of it. It is hardly surprising that photography and art have enjoyed an uneasy relationship from the start. Artists have generally treated the photograph as something like a preliminary sketch, as a convenient source of ideas or record of motifs to be fleshed out and incorporated into a finished work. Academic painters found the detail provided by photographs to be in keeping with their own precise naturalism. Many other kinds of artists resorted to photographs, though not always admitting it. Photography has in turn been heavily influenced throughout its history by the painter's mediums, and photographs may still be judged according to how well they imitate paintings and drawings. To understand photography's place in the history of art, we must recognize the medium's particular strengths and inherent limitations. In 1822 a French inventor named Nicephore Niepce (1765-1833) succeeded, at the age of 57, in making the first permanent photographic image, although his earliest surviving example (fig. 937) dates from four years later. He then joined forces with a younger man, Louis-Jacques-Mande Daguerre (1789-1851), who had devised an improved camera. After ten more years of chemical and mechanical research, the daguerreotype, using positive exposures, was unveiled publicly in 1839, and the age of photography was born. The announcement spurred the Englishman William Henry Fox Talbot (1800-1877) to complete his own photographic process, involving a paper negative from which positives could be made, that he had been pursuing independently since 1833. 937. NICEPHORE NIEPCE. View from His Window at Le Gras. What motivated the earliest photographers? They were searching for an artistic medium, not for a device of practical utility. Though Niepce was a research chemist rather than an artist, his achievement was an outgrowth of his efforts to improve the lithographic process. Daguerre was a skilled painter, and he probably turned to the camera to heighten the illusionism in his huge painted dioramas, which were the sensation of Paris during the 1820s and 1830s. Fox Talbot saw in photography a substitute for drawing, as well as a means of reproduction, after using a camera obscura as a tool to sketch landscapes while on a vacation. The interest that all of the founders had in the artistic potential of the medium they had created is reflected in their photographs. 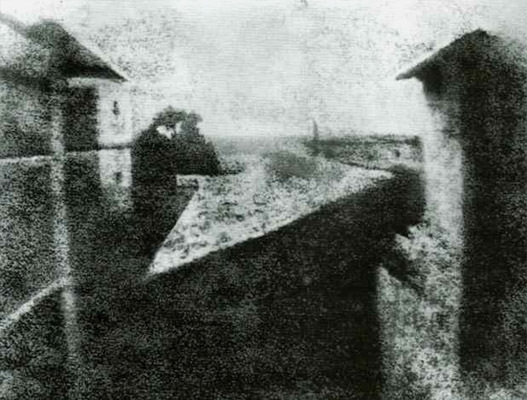 Daguerre's first picture (fig. 938) imitates a type of still life originated by Chardin while Fox Talbot's Sailing Craft (fig. 939) looks like the English marine paintings of his day. 938. DAGUERRE Louis JACQUES MANDE. Still Life. 1837. 939. WILLIAM HENRY FOX TALBOT. Sailing Craft. �. 1845. That the new medium should have a mechanical aspect was particularly appropriate. It was as if the Industrial Revolution, having forever altered civilization's way of life, now had to invent its own method for recording itself, although the transience of modern existence was not captured by "stopping the action" until the 1870s. Photography underwent a rapid series of improvements, including inventions for better lenses, glass-plate negatives, and new chemical processes, which provided faster emulsions and more stable images. Since many of the initial limitations of photography were overcome around midcentury, it would be misleading to tell the early history of the medium in terms of technological developments, important though they were. The basic mechanics and chemistry of photography, moreover, had been known for a long time. The camera obscura, a box with a small hole in one end, dates back to antiquity. In the sixteenth century it was widely used for visual demonstrations. The camera was fitted with a mirror and then a lens in the Baroque period, which saw major advances in optical science culminating in Newtonian physics. By the 1720s it had become an aid in drawing architectural scenes. At the same time, silver salts were discovered to be light-sensitive. Why, then, did it take another hundred years for someone to put this knowledge together? Much of the answer lies in the nature of scientific revolutions, which as a rule combine old technologies and concepts with new ones. (They do this in response to changing world views that they, in turn, influence.) Photography was neither inevitable in the history of technology, nor necessary to the history of art; yet it was an idea whose time had clearly come. If we try for a moment to imagine that photography was invented a hundred years earlier, we will find this to be impossible simply on artistic, apart from technological, grounds: the eighteenth century was too devoted to fantasy to be interested in the literalness of photography. Rococo portraiture, for example, was more concerned with providing a flattering image than an accurate likeness, so that the camera's straightforward record would have been totally out of place. Even in architectural painting, extreme liberties were willingly taken with topographical truth. The invention of photography was a response to the artistic urges and historical forces that underlie Romanticism. Much of the impulse came from a quest for the True and the Natural. The desire for "images made by Nature" can already be seen, on the one hand, in Cozens' ink-blot compositions (see fig. 864), which were "natural" because they were made by chance; and, on the other, in the late-eighteenth-century vogue for silhouette portraits (traced from the shadow of the sitter's profile), which led to attempts to record such shadows on light-sensitive materials. David's harsh realism in The Death of Marat (fig. 859) had already proclaimed the cause of unvarnished truth. So did Ingres' Louis Berlin (fig. 886), which established the standards of physical reality and character portrayal that photographers would follow. Like lithography, which was invented in 1797, photography met the growing middle-class demand for images of all kinds. By 1850, large numbers of the bourgeoisie were having their likenesses painted, and it was in portraiture that photography found its readiest acceptance. 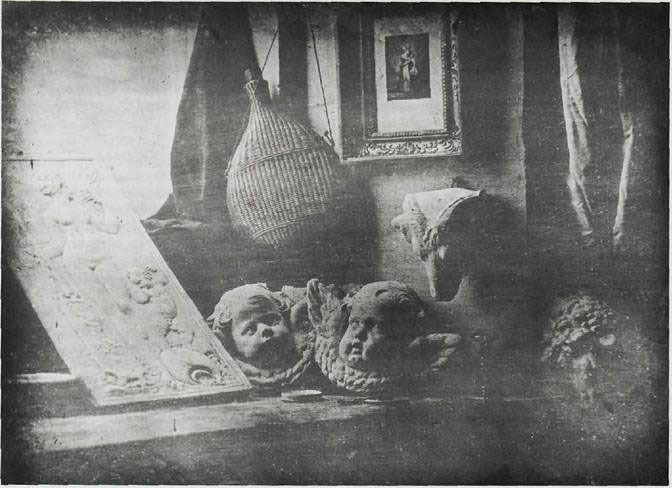 Soon after the daguerreotype was introduced, photographic studios sprang up everywhere, especially in America, and multi-image cartes de visiles, invented in 1854 by Adolphe-Eugene Disderi, became ubiquitous. Anyone could have a portrait taken cheaply and easily. In the process, the average person became memorable. Photography thus became an outgrowth of the democratic values fostered by the American and French revolutions. There was also keen competition among photographers to get the famous to pose for portraits. Gaspard Felix Tournachon (1820-1910), better known as Nadar, managed to attract most of France's leading personalities to his studio. Fike many early photographers, he started out as an artist but came to prefer the lens to the brush. He initially used the camera to capture the likenesses of the 280 sitters whom he caricatured in an enormous lithograph, Le Pantheon Nadar. 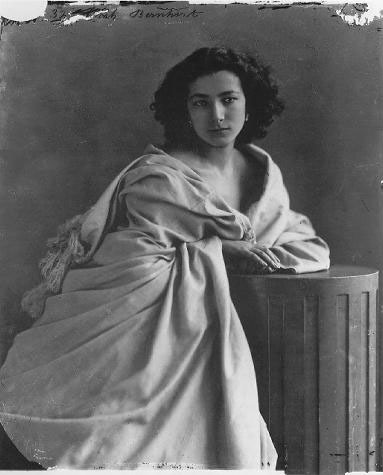 The actress Sarah Bernhardt posed for him several times, and his photographs of her (fig. 940) are the direct ancestors of modern glamour photography (compare fig. 1225). With her romantic pose and expression, she is a counterpart to the soulful maidens who inhabit much of nineteenth-century painting. Nadar has treated her in remarkably sculptural terms. Indeed, the play of light and sweep of drapery are reminiscent of the sculptured portrait busts that were so popular with collectors at the time. 940. NADAR. Sarab Bernhardt. 1859. Early photography reflected the outlook and temperament of Romanticism, and indeed the entire nineteenth century had a pervasive curiosity and an abiding belief that everything could be discovered. 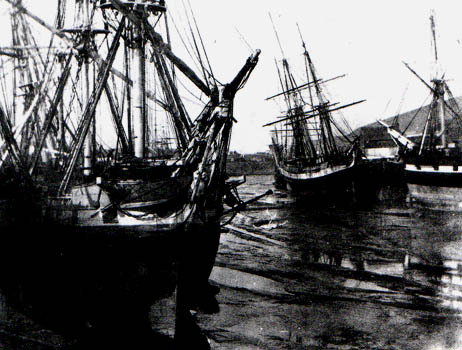 While this fascination sometimes manifested a serious interest in science�witness Darwin's voyage on the Beagle from 1831 to 1836�it more typically took the form of a restless quest for new experiences and places. Photography had a remarkable impact on the imagination of the period by making the rest of the world widely available, or by simply revealing it in a new way. Sometimes the search for new subjects was close to home. 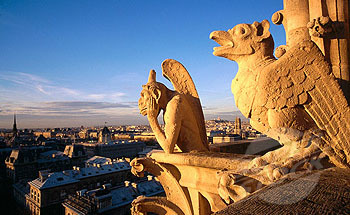 Nadar, for example, took aerial photographs of Paris from a hot-air balloon. This feat was wittily parodied by Daumier (fig. 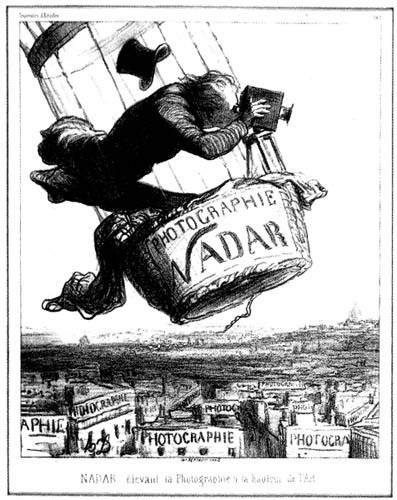 941), whose caption, "Nadar Elevating Photography to the Height of Art," expresses the prevailing skepticism about the aesthetics of the new medium. Nadar Elevating Photography to the Height of Art. A love of the exotic was fundamental to Romantic escapism, and by 1850 photographers had begun to cart their equipment to faraway places. The same restless spirit that we saw in George Caleb Bingham's Fur Traders Descending the Missouri (see fig. 914) also drew photographers to the frontier, where they documented the westward expansion of the United States, often for the U.S. Geological Survey, with pictures that have primarily historical interest today. An exception is the landscape photography of Timothy O'Sullivan (c. 1841-1882), who often preferred scenery that contemporary painters had overlooked. Fie practically invented his own aesthetic in photographing the Canon de Chelle (fig. 942), for it conforms to no established pictorial type. The view fills the entire photograph, allowing no visual relief and lending it awesome force. The composition is held together by the play of lines of the displaced strata of the rock, which creates a striking abstract design. O'Sullivan's control of tonal relations is so masterful that even color photographs taken since then of the same site have far less impact. 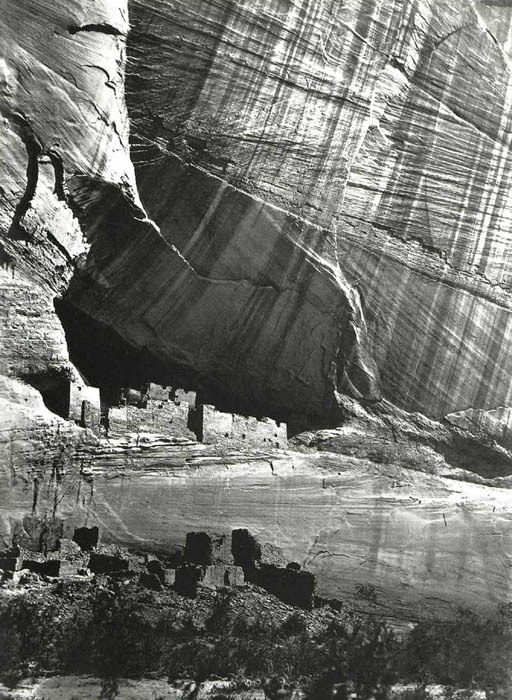 (now Canyon de Chelly National Monument, Arizona). The unquenchable thirst for vicarious experiences accounts for the expanding popularity of stereoscopic daguerreotypes. Invented in 1849, the two-lens camera produced two photographs that correspond to the slightly different images perceived by our two eyes. When seen through a special viewer called a stereoscope, the stereoptic photographs fuse to create a remarkable illusion of three-dimensional depth. Two years later, stereoscopes became the rage at the Crystal Palace exposition in London (see fig. 977). Countless thousands of double views were taken, such as that in figure 943. Virtually every corner of the earth became accessible to practically any household, with a vividness second only to being there. this success waned, except for special uses. People were simply too habituated to viewing pictures as if with one eye. Later on, when the halftone plate was invented in the 1880s for reproducing pictures on a printed page, stereophotographs revealed another drawback. As our illustration shows, they were unsuitable for this process of reproduction. From then on, single-lens photography was inextricably linked with the mass media of the day. (cast 1586; world's largest caliber, 890 mm; presently inside Kremlin). Fundamental to the rise of photography was the pervasive nineteenth-century sense that the present was already history in the making. Only with the advent of the Romantic hero did great acts other than martyrdom become popular subjects for contemporary painters and sculptors, and it can hardly be surprising that photography was invented a year after the death of Napoleon, who had been the subject of more paintings than any secular leader ever before. At about the same time, Gericault's The Raft of the "Medusa" (fig. 883) and Delacroix's The Massacre at Chios (fig. 888) signaled a decisive shift in the Romantic attitude toward representing contemporary events. This outlook brought with it a new kind of photography-photojournalism. Its first great representative was Mathew Brady. (1823-1896), who covered the Civil War in the United States. 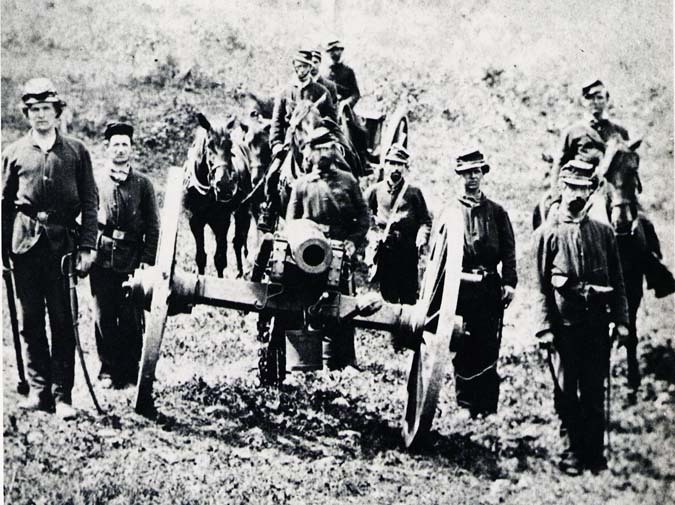 Other wars had already been photographed, but Brady and his 20 assistants (including Timothy O'Sullivan), using cameras too slow and cumbersome to show actual combat, nevertheless were able to bring home the horrors of that war with unprecedented directness. 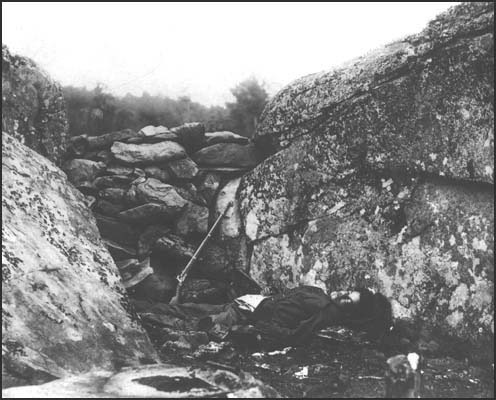 Home of a Rebel Sharpshooter, Gettysburg (fig. 944) by Alexander Gardner (1821-1882), who left Brady to form his own photographic team in 1863, is a landmark in the history of art. Never before had both the grim reality and the significance of death on the battlefield been conveyed so inexorably in a single image. Compared with the heroic act celebrated by Benjamin West (see fig. 860), this tragedy is as anonymous as the slain soldier himself. The photograph is all the more persuasive for having the same harsh realism found in David's The Death of Marat (see fig. 859), and the limp figure, hardly visible between the rocks framing the scene, is no less poignant. In contrast, the paintings and engravings by the artists�notably Winslow Homer � who illustrated the Civil War for magazines and newspapers were mostly genre scenes that kept the reality of combat safely at arm's length. 944. ALEXANDER GARDNER. Home of a Rebel Sharpshooter, Gettysburg.